Completely renovated 2 storey terraced country house for sale with 3 bedrooms, 2 bathroom and an amazing garden situated in a hamlet close to the village Almanzora (Almería). Almanzora is a village which offers all amenities, such as a pharmacy, tapas bars, school, supermarket, communal pool, etc. 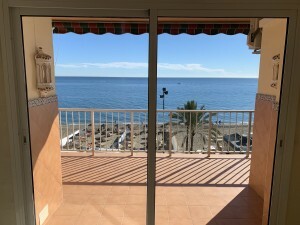 The large town of Albox is just 4 km away, and about 30 minutes you can find the Almeria coast, with its wonderful beaches, such as: Vera, Garrucha and Mojacar, and only 1 hour by car is the airport of Almeria. In front of the house there is a covered porch from where you enter the house through the front door. The terrace of the porch is a lovely sitting area to enjoy the views over the valley. The front door opens directly to the cosy living room with a log burner, on the left through an arch is the dining room. From the living room an arch leads to the spacious fully equipped kitchen with a lot of units and granite work surfaces. Next to the kitchen there is a sun room, ideally in the winter, patio doors lead to a large courtyard. The courtyard has a fly screen enclosed dining area. Back to the kitchen, a hallway leads to a modern bathroom with shower. From this hallway a featured staircase leads to the first floor. On the first floor there is the master bedroom with a fitted wardrobe with a lot of storage space, an air conditioning unit and a very spacious bathroom with walk-in shower. There are also two double bedrooms, both can be reached from a little sitting area. Next to the house there is parking area for all the neighbors and opposite the house, next to the parking area, is an additional plot of 1173m2, planted with olive and almond trees. There is a storage room for logs, a chicken ren and a lovely sitting area. There is also a 2000 liter back-up watertank. This is a property full of character and it will make a perfect (holiday) home. It is situated in a quiet and peaceful hamlet. 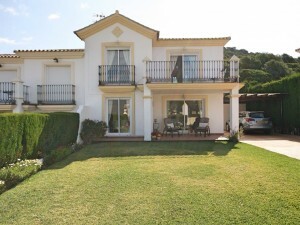 Please don`t hesitate to contact us to view this property!